Mother's Day may be just around the corner, but there's still time to spoil a mom in your life with a personal gift you can make on your own. I'm a huge fan of DIY, that is a well known fact. What may not be as well known is that I love to get handmade items, just as much as I love to make them. There's something heartfelt about a present that has been crafted rather than purchased. Of course, not everyone feels this way, but if your mom is like me and you're looking for a last minute idea to wow her, I have a bunch of simple ideas for you....and every one of them is guaranteed to come out looking fabulous no matter your skill level. Scouts honor. It's the Exquisitely Unremarkable way. Ok, I haven't been a scout for decades but I'm sure it still counts. I received this gift from my own children last year and I LOVE it! They mixed 1 cup brown sugar, with a 1/2 cup of vegetable oil (you can use olive oil) and 1 tablespoon of vanilla together and put it in a mason jar. They raided my ribbon stash to add a simple bow and wrote the loveliest poem about me and framed it. Seriously, this was one of the best gifts I ever received. Sweet words and soft feet rate high in my book. I promise, you can't mess this one up and if you throw in a few coupons to rub mom's feet with the scrub, um, you can totally secure your place as #1 kid. Just don't tell my kids I said that. 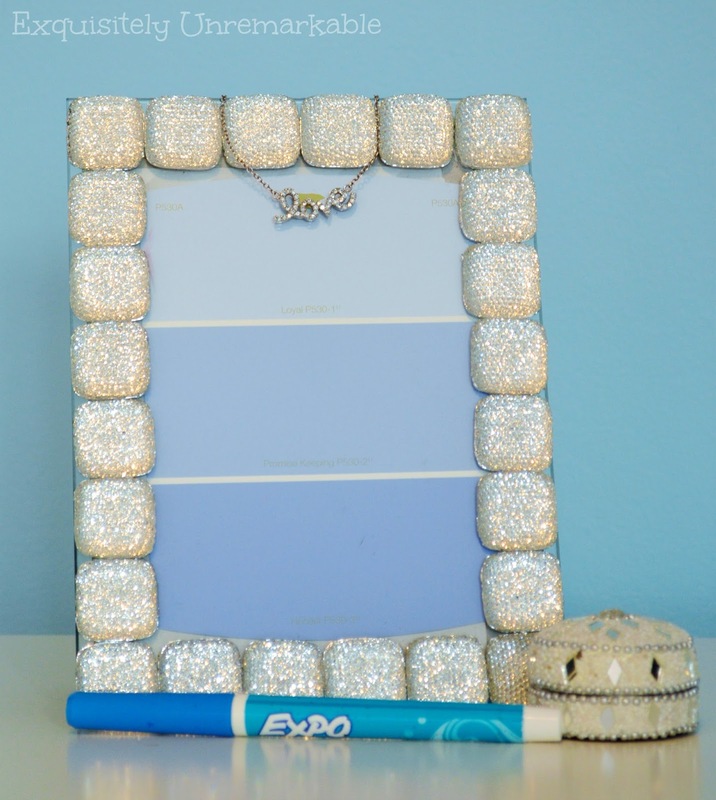 Keep mom organized with this elegant whiteboard made from a large paint sample and a bargain frame. We adorned the frame with a necklace ~ a little extra bling for the board and mom's neck. Why not give mom some flowers she can enjoy all year long? Follow the ridiculously easy instructions for this elegant project that involves little more than deconstructing dollar store stems. Is mom a magazine fan? Well place an order for her favorite read and make this simple hanger so she has a spot to display her pretty new subscription. Decoupage old book page scraps to a wooden hanger and voila! Instant fabulous for the home decor fan. Have a tea party with mom, just like the old days! Pick up a few cups, on sale or at thrift stores, fill them with her favorite blend and spend the day sipping...or better yet, take mom out shopping for the day and find a cup that suits her. The tea cup will serve as a memento of your precious time spent together and after all, that's a mom's best gift! So you're really more of a cook than a crafter, huh? Ok, no problem. How about making mom a meal she won't forget. Try my mom's really easy (I'm not kidding, I can barely cook and I am awesome at this) recipe for Chicken Pizziola. You will not be disappointed and neither will mom...but remember, you have to clean up, too. I mean it is Mother's Day. So you've read all the ideas, carefully pondered your choices, thought about which one mom would prefer....and....and you've decided that you really just want to buy her something and be done with it. Ok, no problem, I say go with tulips. They are super cheap at the grocery store (mom wouldn't want you to spend a lot), look good in any container, from a crystal vase to a tin bucket, and if they come attached to you and with a big hug, they're bound to be a hit. Mom approved. Well, that's it, that's all I've got for you today. I hope you've found some thrifty gift-y inspiration or maybe stumbled across an idea you'd like to make for yourself. They're easy enough and there's nothing wrong with giving yourself a little gift every now and then. Are you a homemade giver? You've got some nifty ideas here that are certainly affordable. I'm sure lots of daughters can make use of them for their mothers. I could use dome of that scrub! Whatever it is your getting or giving, coming from family, always makes it very special right?! Agreed, Vel! Those are always the best gifts! :) Happy Mother’s Day! Thank you, Helen. Happy week to you, too! I love that you kids made you the foot scrub. I have seen this all over Pinterest and it looks so easy to make. I will give this a try. Thanks for sharing all of these ideas. Have a wonderful week and Happy Mothers Day! I think that's where they found the idea, Julie. They modified the recipe based on what we had, but it works great! ;) Happy Mother's Day! I have seen the recipes for the foot scrub but never tried them. I may have to give it a try. I think that publishing your mom's recipes is an inspired idea. We found that when my grandmother was in the nursing home it was easier to visit when there was something to do. In her case her memory was affected so we worked on jigsaw puzzles. Both of you will enjoy the process. Please consider the idea of putting together and publishing a collection of favorites with her comments, even if it is only a three ring binder, to share with family members. I think it would be a keepsake that many would appreciate. 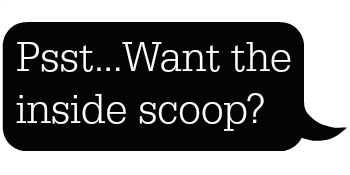 You could start the books now and as you publish each post you could distribute a new page. That chicken looks fantastic, by the way. Holland Michigan Tulip Festival is happening this week. . . Quite the sight and lots of color . . .
Google will take you there . . .
My Mother's Day giving for my daughter, daughter in law s to dig my perennials and deliver to them. My mom is no longer with us . . . she would like it that I am doing that . . . She taught me . . . Japanese Iris is my favorite delivery . . . I have some of my mother’s and grandmother’s plants in my yard, Lynne and you’re right, best gift ever. Every spring when they bloom, I remember and smile! Enjoy the day! 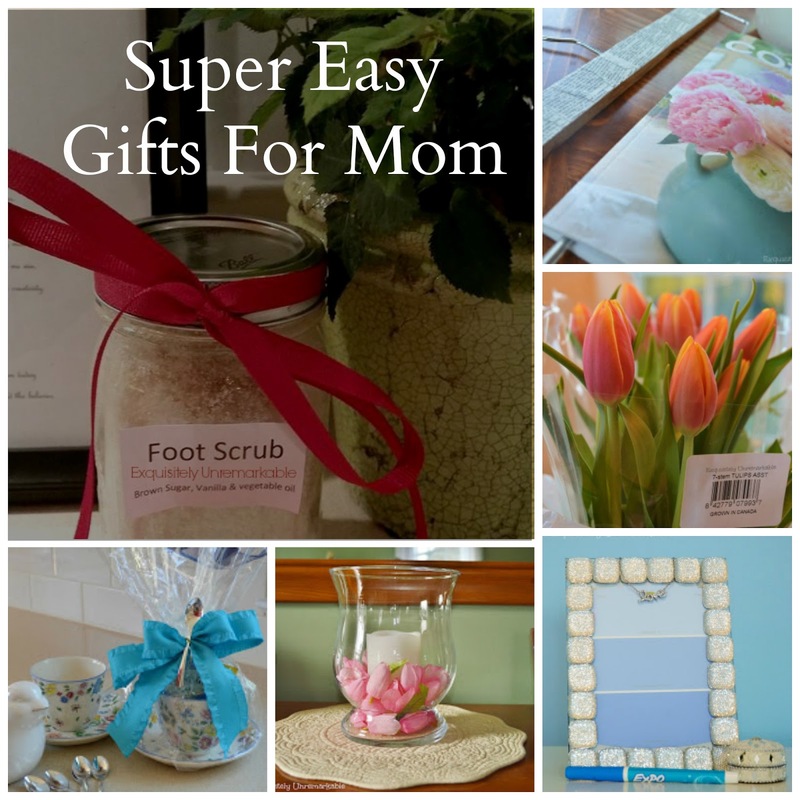 Great ideas for Mother's Day gifts. Homemade gifts are always the best. I have not heard of the paint sample whiteboard. Will have to give that diy a try! That whiteboard was my daughter's creation. She is very crafty on her own! What cute ideas for Mother's Day. That foot scrub sound great. I bet it smells great too to soak in. These are all great things thanks for sharing. Thanks Kris. Yes, it smells great…like home baked cookies. Way better than feet! ;) Happy Mother’s Day! Love all your ideas! Just a tip for tulips, if y'all don't know (I just found out a month ago): cut your tulip stems on an angle, and poke a pinhole in the stem just below the stem, so they will last longer! It really works! Happy Mother's Day, everyone. Such a lovely and thoughtful post filled with wonderful ideas that don't break the bank to make! I liked the foot scrub idea - so practical and wonderful too! 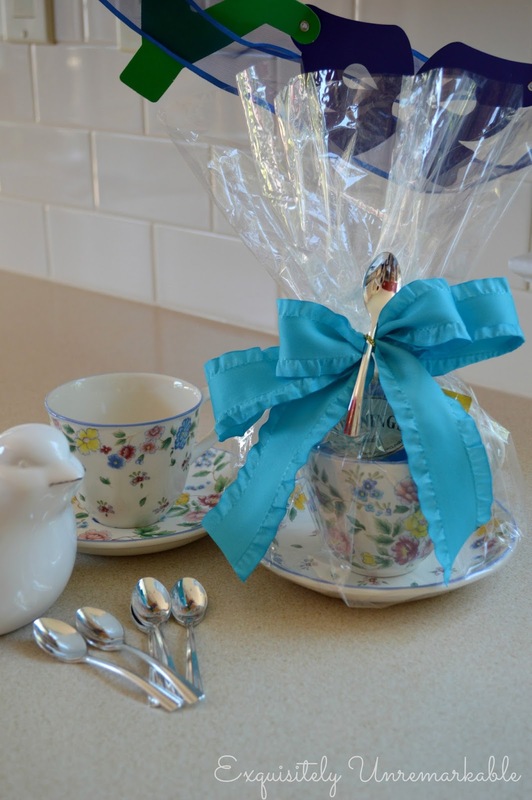 I love tea, drink it all day long, and would love a tea cup gift like the one you showcased - all marvelous ideas! Thanks for sharing these timely gifts! Hugs to you today! These are all great ideas! I love the foots scrub and the magazine hanger the best (I'm all thumbs!). Wonder if I have time for some of the "new young moms" in my life? Thank you Jane! They are all super easy to make, trust me, I am all about simple…coming up with the time to do it? Oh boy, I hear you loud and clear! Thanks so much for the visit! I love every one of those ideas and would love to receive any of them myself - perhaps I should be sending out links to your post!.....or make one or two for myself! 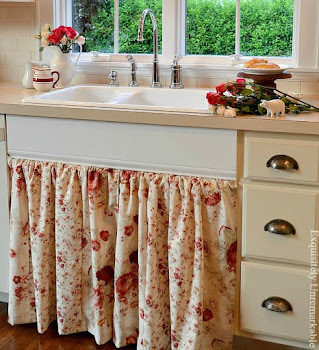 Wonderful ideas and all done with items easily found or already on hand around the house! I like that! 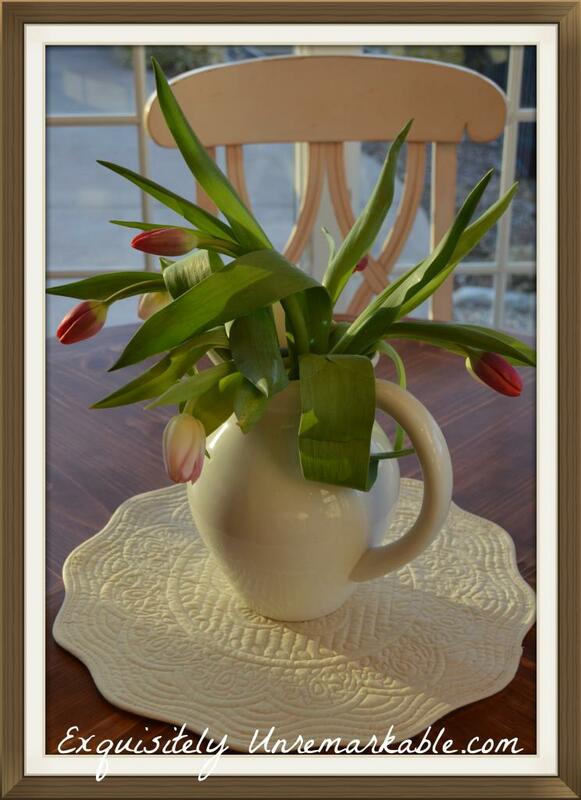 Tulips are always perfect, as are foot scrubs! Thank you so much for sharing these! I hope you have a wonderful evening!! Thank you Benita, I hope you have a wonderful evening and a wonderful Mother's Day! Great ideas Kim. I've always loved to give and receive homemade gifts...much more personal. 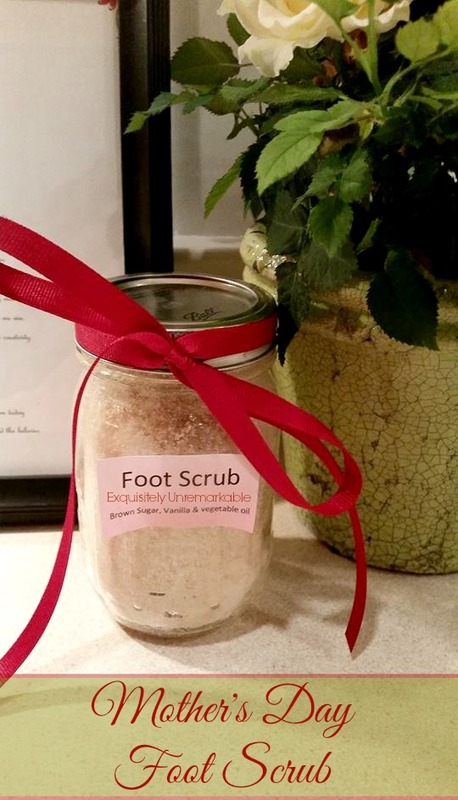 I really liked your foot scrub idea, I think my husband would like that! I love giving handmade gifts and these are all great ideas. Mothers Day is always a special day but in the UK we celebrated ours a little earlier than you. I had a lovely day - hope all your readers did too . Sometimes those teenagers really surprise me with their sweetness...thanks Deb! I had no idea the foot scrub was so easy to make. Thank you for the idea! I love them all. It's going to be difficult to determine which one I like best and I have to remember that it is for mom - not me. They’re so easy…I say make one for you, too! ;) In your spare time…haha! Happy Mother’s Day! Kim, great ideas! Both my mom and mil have passed, but I like to give a little something to my daughters and daughter in laws. Thanks for sharing with SYC. Thanks for the party, Jann and I hope that you had a wonderful day with your family…and remembering your mom and mil.